Lock in a great price for ibis London Luton Airport – rated 8.1 by recent guests! Location was fine with only a short walk to Luton airport. Wasn't expecting too much, it was very basic and the room was quite small, bar was fine, restaurant food looked ok. I choose the Ibis Hotel for it's location because of the early flight. There is a shuttle bus stop nearby and the way to the airport is only 10 minutes walk. The staff is friendly and helpful, the room is clean and tidy, with comfy bed and clean bathroom. Great breakfast!! 10 mins walk from the airport. 24/7 check in. Location, location, location... excellent location easy walk to and from the airport. Close to Luton, warm room in a freezing day, super helpful staff. Great for short stay. Very close to the airport. 5minute walk from the arrivals terminal. very good value for many. Rooms were very basic but with all one need for a night at the airport. Perfect for Luton airport, comfortable, and staff always excellent. Everything. The staff were very helpful and friendly and lovely to talk to. We are looking forward to our next stay next year. ibis London Luton Airport This rating is a reflection of how the property compares to the industry standard when it comes to price, facilities and services available. It's based on a self-evaluation by the property. Use this rating to help choose your stay! One of our top picks in Luton.Ibis Luton Airport Hotel is a 10-minute walk from Luton Airport and 10 minutes' drive to Luton town center. A budget hotel, it offers modern rooms, a 24-hour front desk and impressive views of the runway. The rooms at Ibis Luton each have a flat-screen TV with satellite channels. Rooms also feature a modern bathroom, tea/coffee facilities and a work desk. The spacious café serves light meals and snacks, and the bar has a sun terrace for a relaxing drink. Breakfast buffets as well as an English breakfast are available daily, featuring French pastries, fruit and fresh coffee. Luton Airport Parkway Station is just 2,650 feet away, offering regular trains to London St Pancras within 40 minutes. The M1 motorway is within easy reach, and The Mall Shopping Center is a 10-minute drive away. 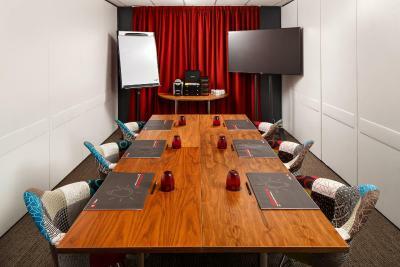 The hotel also has 3 well-equipped, naturally lit meeting rooms that can accommodate up to 55 people. There is on-site car parking for up to 74 cars. When would you like to stay at ibis London Luton Airport? This brand offers you the ultimate comfort: a new innovative bedding, a comfortable and well-equipped room, modern and design welcome areas and a 24/7 menu. House Rules ibis London Luton Airport takes special requests – add in the next step! ibis London Luton Airport accepts these cards and reserves the right to temporarily hold an amount prior to arrival. The car park costs GBP 9 for residents and GBP 15 for nonresidents for overnight use. Early breakfast (one from 4 am) was very limited. Not even a cheese or ham. Just stayed for one night so didn't find anything bad. Close to Luton airport, friendly staff. The personnel was exceptional. I loved the breakfast. Excellent location. Staff where nice and friendly and very helpful.Room very nice suited our needs. It was a little noisy in the hallways outside our room. Sooo close and easy to get to the airport! And the staff are wonderful. Could not leave luggage, room was small. Reasonable walking distance to airport, quick check in. Close to the airport. Cheerful and friendly reception staff ! It is only me being fussy but I don't like the pillows! I love the staff at this place - they couldn't be more helpful. The breakfast is superb. Exceptionally noisy group of lads in rooms near us woke us up 1 am - heard staff asking them to be quiet after about 3 other nearby residence also knocked and complained !